What is the Tamar project in Ubatuba? Five of the seven species of sea turtles are found in Brazil. All of them are threatened with extinction and some even critically endangered! What Tamar does is a research, conservation, and handling of the sea turtles. Besides having medical centers for trying to save turtles caught in fishermen’s nets and injured by boats, they also have education centers for the public, teaching people what to do to help to save them too and what are the biggest threats to sea turtles. Yes, each center has an aquarium with captivated turtles, but those are the main reasons, why families with children come and learn so much important info about preserving the sea turtles and spend their money for entrance and souvenirs, which then help running this project. Did you know, that majority of turtles that arrive at this center die because of malnutrition due to plastic in their stomachs? The week we visited, they received 30 sea turtles – that’s one week, in one of the centers. With 25 centers all over Brazil, it makes over 700 dead turtles every week. That’s just crazy! Now, what we can do, to help to save sea turtles? 1. Go to see turtles responsibly. Don’t touch, feed or swim with sea turtles in the wild. Keep your distance! If you go on a turtle tour, do so with a trained guide and just observe them. visible from the beach at night if you are near sea turtle nesting beach. Sea turtles dig in the dark. Artificial light can distract them or confuse nesting sea turtles and their hatching. Don’t use flashlights on the beach and turn outdoor lights and close the curtains at night if you stay in a beach house. 3. Don’t buy anything made of turtles. When traveling, you may find jewelry and other items made from sea turtles. Don’t support this ugly business by buying these items. It’s also illegal to bring them on United States and it will be confiscated at the customs. 4. Reduce, reuse and recycle plastic. Millions of tons of plastic enter the ocean every year. Sea turtles might eat them, get sick and die. They can also get harmed by or trapped in pieces of plastic. Try to avoid plastic and choose alternatives, and if there’s no other choice than plastic, make sure it goes to recycling. 5. Recycle your fishing line. Fishing is a great vacation sport, but sea turtles can’t see discarded fishing lines and can be injured by them. Collect loose fishing lines and recycle it. Look for a recycling container near you. Boats can injure or kill turtles when they run into them. 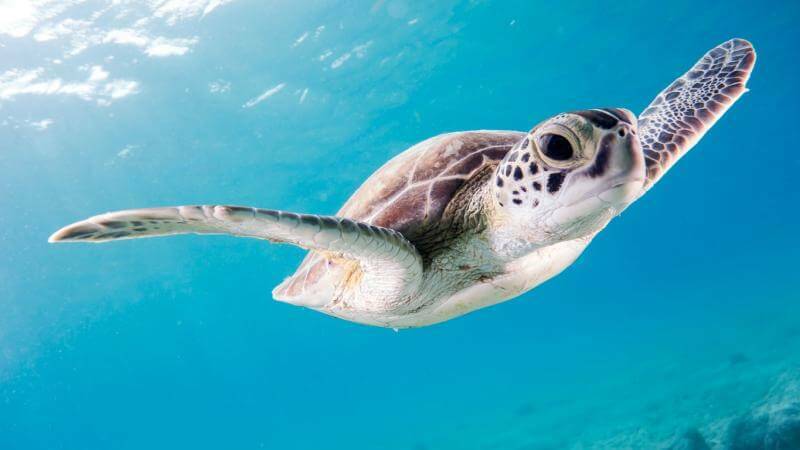 Boaters can prevent collisions by slowing down in areas where sea turtles are repent such our coastal waters, near nesting beaches, seagrass beds and coral reefs. Though many of you might think, that recycling your plastic trash is enough, the best way really is to reduce plastic waste. And the sea turtles is just one of the reason, why should we avoid plastics. It doesn’t mean that you have to beat yourself for every plastic bag or cup you use, sometimes it is not inevitable. But with small steps, we can start a process of big changes. Every time you go shopping. If you have to buy a plastic bag, re-use it for the next shopping bag or use it as a trash bag. If you want to keep it stylish and support small business, check out this Czech store which recently added food bags to their shop. Try to avoid them also in the bars. If you cannot live without your straw, there are loads of reusable metal or glass straws on the market. Try this foldable Final Straw, a kick starter winner you can carry with you anywhere. 3. Have a reusable water bottle. Yes, I know, this is an old one, but it can do a great deal. Don’t like drinking water from the pipe because of this flavor? Try water bottle with a filter. My absolute favorite is LifeStraw, which you can also fill up in nature as it kills 99,9% bacteria. 4. Stop using food foil for wrapping snacks. Wrap your sandwich in reusable bee wax food paper instead of plastic foil. It’s convenient, environmentally friendly and comes in beautiful colors and patterns. Get yours here. 5. Do your grocery shopping in package free shops. They are growing fast so I’m sure there will be one in your city very soon. 6. Get rid of your plastic toothbrush. Just think about it, you buy a new one every three months and it’s made of a big sturdy plastic, where do you think it goes? What about a bamboo toothbrush? It's not even that more expensive than the plastic ones. 7. For women – start using a menstruation cup. I have an OrganiCup for several years and I’m very satisfied with it. You can get yours here. Besides the planet, you will also save money – think about how many tampons or menstrual pads you buy every month? 8. Use soap & shampoo bars. Really our grandmothers knew it the best, let’s get back to it. Soap bars don’t come in plastic bottles, will last you longer than liquid soaps and don’t dehydrate your skin so much. Since you are at it, try a shampoo bar as well and save the world 4 plastic bottles – shampoo, conditioner, shower gel, and body milk. On Amazon you can find various handmade and organic soaps with different prices. You might be thinking about what change one person can make. Probably not much. That’s why it is important to share and encourage other people to make small steps towards better future for us and the planet. Check more ideas for Eco friendly travel products here.